Is this meditating humanoid our future? Dubai: Are you prepared to live in a world where your knowledge and beliefs will ethereally be taken out by the gaze of human-like synthetic beings and stored alongside billions of other people’s consciousness? 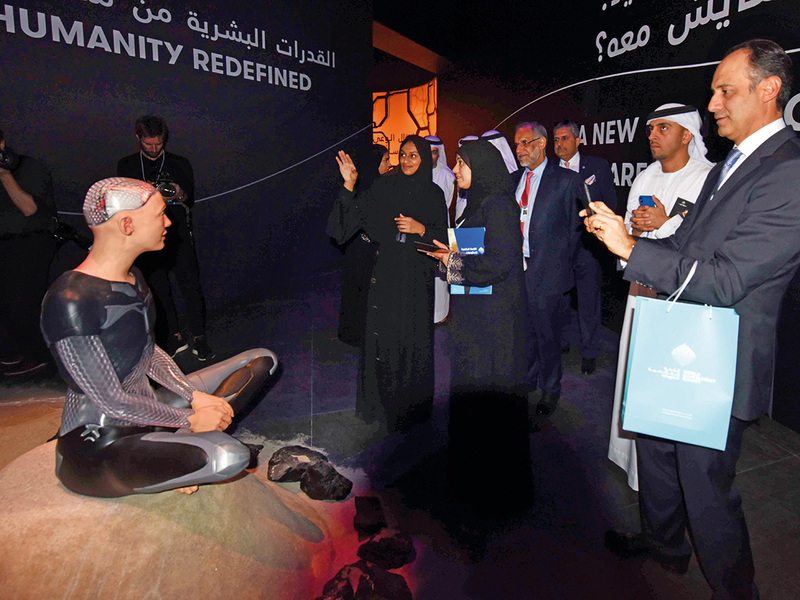 That world is coming in the year 2100, according to the Museum of the Future at the World Government Summit 2019 in Dubai. And the signs of its coming are already here. Unity, a genderless conceptual humanoid, is the embodiment of that vision, and it has been unveiled to our world, in our time, at the museum exhibit at the summit in Dubai. It was first revealed on Sunday during a tour of the summit by His Highness Shaikh Mohammad Bin Rashid Al Maktoum, Vice-President and Prime Minister of the UAE and Ruler of Dubai. Delegates at the summit visiting the museum exhibit have since been left intrigued, to say the least, by Unity. Sitting cross-legged, almost as if in a meditative state, Unity occasionally opens its eyes to look at visitors gathering curiously, and quietly, around it. Some start taking pictures straight away while others snap their fingers, as if to awaken Unity or grab its attention. It opens its eyes and its gaze locks on to you at times, as if making eye-contact, and follows you around for a bit before letting go. It is this gaze that will, perhaps, one day “transfer” your innermost reserves of knowledge and beliefs into Unity-like beings, said Hessa Lootah, a representative of Dubai Future Foundation, which is showcasing Unity at the summit. “The idea is to have it store every human’s knowledge, beliefs and experiences within it, simply by having just eye-contact with you. And the question that we ask is, whether humanity is ready to coexist with ‘creatures’ that know everything about everyone?” she added. That question begets other questions, Lootah said. Lootah said such creatures could be the “third generation of humanity, Humanity 3.0”. She explained that we are the first generation, the second might be half human-half machine, and the third would be Unity-like creatures — which will carry inside their non-flesh bodies the collective knowledge of humans. “They will be living with us like humans; we would refer to them as equals of humans,” Lootah said. Sitting quietly, Unity sometimes closes its eyes and gently slides into a slumber, as if dreaming. Sometimes it smiles, but sometimes it frowns.